The Big Event returns on Saturday, and the focus this year is unifying the Ole Miss and Oxford communities. The Big Event, which began in 2011, occurs one day every spring, but it is organized throughout the year by six executive committees, 32 executive committee members, 100 subcommittee members, and 220 project leaders. Two weeks after each Big Event, the co-directors choose their successors, and by the end of the spring semester a new 30-member executive board is selected. This year, approximately 1,500 volunteers will take on about 150 projects throughout Lafayette County. “One thing we did differently (this year) is we wanted to appear as more than just this one day of service, so we decided to choose one project to specifically fundraise for and do a big project for,” Digregorio said. That one project benefits the Lafayette County and Oxford Public Library. The Big Event raised $12,000 for new bookshelves, and volunteers from the Big Event will install the bookshelves on Saturday. The 1,500 volunteers is a slight decline from last year. Digregorio said that this is the result of a new recruitment process that aims for more volunteers who sign up to actually show up, whereas the turnout in previous years has been well below the number of students who register for the event. This year, the Big Event emphasizes the goal of connecting the citizens of the county with the students at the university. “A lot of time in college, it is easy to stay in the college bubble, but the Big Event reminds students to thank this incredible community for hosting us year round,” Garrett said. Organizers do not seek out projects, but rather are given them through requests. 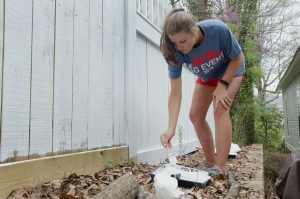 Isaac Jenkins, a senior staff member with Ole Miss Cru, a religious organization, received help through the Big Event last year with an erosion problem in his yard. Although registration has closed, the Big Event will accept walk-ins on Saturday morning.